The BBC and Lee Drew at FamHist both write on the Slow Death of Handwriting. I blogged last April on how I do not blame computers and email, as the stuff I send and receive via email doesn't resemble what I see in family letters. I feel the phone, and unlimited long distance cellular plans, have had a greater effect on the decline of letter writing. Perhaps the best argument for keeping our pens is that otherwise, in a society that is recorded in more detail than any which came before it, we will leave plenty of data but very little of our personalities behind. Our descendants may struggle to read our letters, but they'll never even see most of our texts and e-mails. At the moment I don't think there is a way to save text messages for posterity. However, those who delete their emails are doing the same thing as our ancestors who threw away their letters. Many do delete their emails; and many did throw away letters. In both cases, it's a conscious action that can be changed. The best method, I think, is to print out emails you wish to save twice - once to paper, and once to a PDF file to store digitally. How about you? Are you contributing to the mass extinction of the art? If not, how are you feeding its continued existence? I write a lot of poetry, and while I often compose on a computer, I also often compose with pen and notebook. I haven't discarded these notebooks. So in addition to my saved emails, and blog posts, future generations will see my handwriting. However, when I write with a pen, it is rarely in cursive script. I attended one of the best school districts in the State of Missouri, and they gave up teaching me to write legibly. The summer after fourth grade, they forced me (and no others in my class) to learn to type. I probably shouldn't be proud of the causes, but my early learning of typing has served me well in this computer age. The Google Blog announces they've recently added seven languages to Google Translate. I was actually aware Hungarian was one of their options, as I utilized it 3 weeks ago, though I wasn't aware it was a recent addition. They're up to 41 different languages. Significantly more than Yahoo's Babelfish, which has only 13. Source: Life of Victor Hugo, by Frank Thomas Marzials, John Parker Anderson, published by W. Scott, 1888, p. 13. One of the hardest things about participating in Wordless Wednesday, the times that I have, has been writing down only the source, and not writing down my thoughts about the image. Yesterday's was no exception. Some of my favorite historical photographs are those taken that show an iconic image that no longer exists as it existed at the time of the photograph. 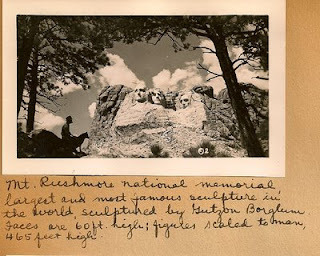 or Mount Rushmore without Teddy Roosevelt. I continue transcribing the testimony given in front of The Dawes Commission by Hartley kin in 1902. Continuing from where the last post left off, Georgia Phillips was excused as a witness, and her father Samuel Tillman Hartley was called to testify. Q. What is your name? A. Samuel T. Hartley. Q. What is your age? A. I am going on seventy-three. Q. What is your post office address? A. Caney, Indian Territory. Q. What is your occupation? A. Farming. Q. Where were you born? A. In Mississippi, in Choctaw County. Q. Are you an applicant before the Commission to be identified as a Mississippi Choctaw? A. Yes, sir; I have been here. Q. Made application to be identified as a Mississippi Choctaw? A. Yes, sir. Q. As Samuel T. Hartley? A. Yes, sir. The case of Samuel T. Hartley M.C.R. 1050, is here referred to as the application made by this witness for identification as a Mississippi Choctaw. Q. Are you acquainted with Georgia Phillips? A. Yes, sir. Q. What relation to you? A. My child. Q. Your daughter? A. Yes, sir. Q. Do you want to testify now in reference to her application made today? A. Yes, sir. Q. How much Indian blood do you claim? A. I have been claiming about three-quarters. Q. What was your father’s name? A. George W. Hartley. Q. Is he the part you claim through or your mother? A. My father. Q. How much Indian blood did he have? A. He was a half. Q. What was his wife’s name? A. Eliza. Q. How much Indian blood did she have? A. She had one-half. Q. You claim three-quarters? A. Yes, sir. Q. What tribe of Indians did he belong to? A. Choctaw. Q. What Choctaws? A. Mississippi Choctaws. Q. When was you born? A. In 1830. March 14, in 1830. Q. In 1830? A. Yes, sir. Q. You know anything about the treaty of 1830 made at Dancing Rabbit Creek between the Indians and the United States government by which the Indians were removed to the Indian Territory; some of them? A. I don’t recollect it. Q. Have you heard of it? A. Yes; I heard of it. Q. How long did you remain in Mississippi after 1830; how old were you when you left there? A. Five years old. Q. Where did your father move to? A. To Arkansas. Q. In what year? A. He came there…let me see…thirty-five. Q. Did he own any land or property of any description priot to 1830 that you know of? A. Not that I know of sir. Q. Did he ever apply to William Ward, Indian Agent, or any one else for the purpose of taking land and remaining in Mississippi? A. No, not that I know of. Q. Did he ever receive any scrip under which he located land in any of the public lands in Tennessee, Alabama, Mississippi, or any of these states for public lands subsequent to 1830? A. Not that I know of. Q. Did he ever own any land in these states? A. I don’t know of any. Q. Where did he die? A. In Arkansas, in Little Rock. Q. Ever own any land in Little Rock, Arkansas or any where else? A. No, sir. Q. Not that you know of? A. Not that I know of. Q. Could he talk the Choctaw language? A. Yes, sir. Q. He could speak it? A. Yes, sir. Q. Ever hear him converse with members of the tribe? A. Yes; I did; I remember it just like a dream. I use to speak it myself. Q. How old were you when he died? A. I was near five years old. Q. Did your mother succeed him? A. Yes, sir. Q. Did your father or mother or any other old person who is now dead tell you that you had Indian blood or did they ever tell you anything about your Indian blood? A. My mother told me many times. Q. What did she tell you? A. She said my father was half Choctaw and that she was half Choctaw and half Cherokee. Q. She was half Choctaw and half Cherokee? A. Yes, sir. Q. And your father was a Choctaw? A. Yes father was a Choctaw. Q. Did she ever tell you of her wish or he or both of them of coming to the West and taking land here? A. No, sir. Q. Ever claim that she had any right here in the Territory or anywhere else? A. Not that I know of. Q. Was she ashamed of her Choctaw blood? A. Not that I know of. Q. Did she ever tell you not to claim it? A. No, sir. Q. You claim how much Choctaw blood? A. I guess I am about three-eighths. Q. You claimed three-quarters little while ago? A. I claim about three-eighths. Q. What did you mean when you said you claimed three-quarters? A. I mean the Cherokee blood. Q. You don’t mean three-quarters Choctaw? A. No, sir; not three-quarters Choctaw. Q. Don’t you know that it is very essential for you to know what you claim? A. I know it is. Q. I want you to know? A. I will know if I can. Q. You don’t claim three-quarters Choctaw blood? A. No, I don’t. Q. How much do you claim? A. I suppose one-quarter. Q. You said three-eighths a little while ago? A. I was speaking about my mother. Q. Why don’t you think about this. Now you look here; you can’t take things back. If you say three-quarters, three-eighths and than one-fourth, you have done one of two things; you have committed perjury or else you don’t know what you are talking about? A. I reckon likely I don’t know what I am talking about. Q. You look like a white man; you don’t look like an Indian? A. I guess my father was a Choctaw. Q. How do you known you are a Choctaw? A. I have always heard; I have heard my mother say; I claimed it the way it came from my mother and father both I had three-quarters. Q. You are testifying now in reference to your daughter’s application; your daughter’s name is Georgia Phillips; she says that she claims three-quarters Choctaw blood because you claim three-quarters; now do you claim three-quarters? A. I would have to bring claim three-quarters if I bring in my Cherokee blood. Q. If you brought in your Cherokee blood? A. Yes, sir. Q. I don’t want you to bring in your Cherokee blood? A. It would be one-quarter. Q. That is what you claimed when you came before the Commission? A. Yes, sir. Q. How do you know you have one-quarter Choctaw blood? A. What my mother as told me and my witness that knowed me. Q. Did any of your Choctaw ancestors comply with article fourteen of the treaty of 1830? A. No, sir. I don’t know. Q. Do you know anything about article fourteen of that treaty? A. No, sir; I don’t. Q. Do you know anything about the treaty of 1830? A. I don’t know sir. Q. Do you know anything about Colonel William Ward the United States Indian Agent? A. No, sir; I don’t. Q. Do you know when the treaty of 1830 was signed? A. No, sir. Q. Do you know when it was ratified? A. No, sir; I don’t. Q. Do you know whether the Mississippi Choctaw Indians who stayed in Mississippi after the treaty of 1830 was ratified were required to go before the United States Indian Agent and register under him or not within six months after the treaty was ratified? A. No, sir; I don’t know it; I was small then. Q. How old are you now? A. I am going on seventy-three. Q. Where were you born? A. Mississippi Choctaw County. Q. You never heard anything about that treaty? A. No, sir; I have no education at all. G. Rosenwinkel being duly sworn on his oath states that as stenographer to the Commission to the Five Civilized Tribes he reported in full all the proceedings had in the above entitled cause on June 17, 1902, and that the above and foregoing is a full, true and correct transcript of his stenographic notes in said cause on said date of June 1902. Subscribed and sworn to before me this 12 day of July 1902. He does seem relatively consistent on what his parents claimed. When he drops his response for himself from three-fourths (Indian blood) to one-fourth (Choctaw blood), he should have dropped it to one-half. But it appears he was focusing on his father being one-half, and forgot to include his mother's half in the equation as well. I find these testimonies fascinating - beyond a source of names and dates of ancestral cousins. Several times the Commission points out that no one in the family 'looks' Native American. It occurs to me that George W. Hartley died when his children were young, and their knowledge of him would come almost entirely from their mother. She might have claimed he was half-Choctaw when he was actually less than that. She appears to have claimed to be all Native American though, half Choctaw and half Cherokee. Apparently those who testified didn't inherit those genes. I don't have a photograph of my second great grandmother Sarah Hartley Denyer, who died in 1898, and didn't get a chance to testify. I have no idea what she looked like. Last week I posted the Dawes Commission testimonies of Samuel Tillman Hartley, Melvin Elijah Van Every (for his wife Margaret Jane Denyer) and Eliza Caroline Reeves from November of 1900. There were eight related testimonies in November of 1900, but the other five didn't present new information (beyond the names and ages of the children of those testifying). In 1902 Samuel T Hartley returned with another daughter. In October I mentioned the difficulty they had with fractions. While both of these testimonies appear in the case file of the daughter, Georgia Phillips, I will separate them into two posts. Q. Do you claim under article fourteen of the treaty of 1830? A. Yes, sir. Q. Do you understand that article? A. No, sir. That one word, 'No,' had a wonderful result. The Commission began to explain it to her. Sure, there are places online to look it up, but below it appears in their words. Muskogee, I.T. June 17, 1902. In the matter of the application for identification as Mississippi Choctaws of Georgia Phillips, for herself and her two minor children, Hester and Raby Phillips. B.S. Johnson, attorney for applicants. Q. What is your name? A. Georgia Phillips. Q. What is your age? A. Thirty-three. Q. What is your post office? A. Caney. Q. Indian Territory? A. Yes, sir. Q. How long have you lived at Caney? A. About two months I reckon. Q. Where did you live before this? A. In Eastern Texas. Q. Where were you born? A. In Texas. Q. Always lived in Texas until you came to the Territory? A. Yes, sir. Q. Where did you live in Texas most of the time? A. In San Saba County. Q. Is your father living? A. Yes, sir. Q. Is your mother living? A. No, sir. Q. What is your father’s name? A. Sam Hartley. Q. What was your mother’s name? A. Margaret Ralls. Q. That was her maiden name? A. Yes, sir. Q. Her name is Hartley now? A. Yes, sir. Q. You claim through which parent father or mother? A. My father. Q. How much Choctaw blood do you claim? A. My father claims to be three-quarters. Q. You claim how much; would you be one-half of that or three-eighths? A. Yes, sir. Q. You claim three-eights then? A. He claims three-quarters. Q. Three-eights is one-half of three-quarters you think, is that right? A. Yes, sir. Q. Has your father ever been recognized in any way or enrolled as a member of the Choctaw tribe of Indians by the Choctaw tribal authorities or the United States authorities in Indian Territory? A. Yes, sir. Q. You mean he applied a year ago? A. Yes; he just applied. Q. He has never been enrolled? A. No, sir. Q. He made application to be identified as a Mississippi Choctaw a year ago; did he not? A. Yes, sir. Q. Have you proof of the marriage of your father and mother with you now? A. No, sir. Q. You know whether it has been filed in the case of your father Sam Hartley, to be identified as a Mississippi Choctaw? A. Yes, sir. Q. It has been filed in your father’s application? A. Yes, sir. Q. Now would you like to refer to the application made by your father Sam Hartley and the records made in that case have it made a part of your own application? A. Yes, sir. Q. Samuel T. Hartley is what relation to you? A. My father. Q. Robert H. Hartley is what relation? A. My brother. Q. Virginia Schultz? A. My sister. Q. Sophronia Cagle? A. My sister. Q. Caroline Taylor? A. My sister. Q. Samuel W. Denyer? A. Cousin. Q. These have all made application have they not to be identified as Mississippi Choctaws? A. Yes, sir. Reference is here made in this application made by Georgia Phillips to M.C.R. 1050, being the application of her father Samuel T. Hartley, et al., and in which reference is made to the above cases. Q. Are you married? A. Yes, sir. Q. What is your husband’s name? A. Miles Phillips. Q. Is he living? A. Yes, sir. Q. Is he a white man or Indian? A. White man, American. Q. You make no claim for him? A. No, sir. Q. Have you any minor children you want to make application for? A. I have two. Q. What is the name of the oldest? A. Hester. Q. Hester Phillips? A. Yes, sir. Q. How old is Hester? A. Twelve years old. Q. What is the name of the next? A. Raby. Q. R-a-b-y? A. Yes, sir. Q. Boy? A. Yes, sir. Q. How old is Raby? A. Five years old. Q. Is that all the children you have? A. Yes, sir. Q. Is your name or the names of your children on any of the tribal rolls of the Choctaw Nation in Indian Territory? A. No, sir. Q. Is Miles Phillips the father of these two children? A. Yes, sir. Q. Are you the mother? A. Yes, sir. Q. Are you and your husband living together at your home? A. Yes, sir. Q. Have you or your husband ever been married before you married each other? A. No, sir. Q. Have you ever made application for citizenship in the Choctaw Nation to the Choctaw tribal authorities in Indian Territory for yourself and children? A. No, sir. Q. Have you ever made application for citizenship in the Choctaw Nation for yourself and children to the Commission to the Five Civilized Tribes under the act of Congress of June 10, 1896? A. No, sir. Q. Have you ever before this time made application for citizenship in the Choctaw Nation for yourself and children by going before either the Choctaw tribal authorities or the United States authorities in Indian Territory? A. No, sir. Q. Have you ever been admitted to citizenship with your children, in the Choctaw Nation by either the Choctaw tribal authorities, the Commission to the Five Civilized Tribes, or the United States Court in Indian Territory? A. No, sir. Q. Do you now come before the Commission to identify yourself and your children as Mississippi Choctaws? A. Yes, sir. Q. You understand that don’t you? A. Yes, sir. Q. What is the name of the ancestor through whom you claim your right to be identified as a Mississippi Choctaw; whom do you claim through? A. George W. Hartley. Q. What relation was he to you? A. Grandfather. Q. How much Choctaw blood did he have? A. I don’t know. Q. Did he live in the old Choctaw Nation in Mississippi or Alabama? A. Yes, sir. Q. Where did he live? A. I can’t tell you only what I have been taught by my parents. Q. Have you been taught that he lived in Mississippi or Alabama? A. Mississippi. Q. In 1830? A. I don’t know. Q. That is seventy-two years ago; don’t you know? A. No, sir. Q. Can you give me the name of any Choctaw ancestor who did live in Mississippi or Alabama in the old Choctaw Nation in the year 1830 and was the head of a family there then? A. No, sir; I don’t know a great deal only what I have been taught. Q. What have you been taught about your Choctaw ancestors? A. I have been taught I had Indian blood. Q. How much Indian Choctaw blood have you been taught you had? A. I can’t understand and explain anything. Q. You can’t understand what relation George W. Hartley is to you? Q. How much Indian blood did George W. Hartley have; one-half or one-fourth? A. One-fourth. Q. Then your father would have one-half of that or one-eighth; aint that right? A. Yes, sir; that is right. Q. What would you have then if your father had one-eighth; you would have one-half of that or one-sixteenth? A. Yes, sir. Q. You claim one-sixteenth? A. Yes, sir. Q. Well a while ago you claimed three-eighths? A. I can’t remember anything. Q. Your grandfather had one-half; did your grandmother have any? A. Yes, sir. Q. How much one-fourth or one-half? A. I don’t know what she was. Q. A little while ago you claimed three-eighth; now you claim one-sixteenth; do you really know how much you do claim? A. No, sir; I reckon not, if my father claims three-quarters – I told you I don’t know. My father claims three-quarters. Q. You claim one-sixteenth or more; you don’t know? A. No, sir; I don’t. Q. Did any of your Choctaw ancestors own any land or claim any in Mississippi or Alabama under article fourteen of the treaty of 1830? A. I don’t know. Q. Did any of your Choctaw ancestors within six months from the ratification of the treaty of 1830 go to the United States Indian Agent Colonel Ward and tell him they wanted to stay in Mississippi, take land there and become citizens of the States? A. I don’t know. Q. Did any of your Choctaw ancestors own any improvements or claim any in Mississippi or Alabama in the old Choctaw nation in the year 1830? A. I can’t tell you; I don’t know. Q. Did any of your Choctaw ancestors go from that old Choctaw Nation East of the Mississippi River to the Choctaw Nation Indian Territory with the other Indians between 1834 and 1838 or forty? A. I don’t know. In 1837 under an act of Congress approved March 3rd of that year and in 1842 under an act of Congress approved August 23rd of that year two Commissions were appointed to go to Mississippi and her claimants under article fourteen of the treaty of 1830. The reason why these two Commissions were appointed was because of the complaints of many Choctaw Indians who stayed back there in the old Choctaw Nation in Mississippi and Alabama after the treaty of 1830 was ratified who refused to go to the Choctaw Nation, Indian Territory. Now these Indians were required, if they wanted to take advantage of the provisions of article fourteen of that treaty, to go to the United States Indian Agent, whose name was Colonel Ward and tell him they wanted to stay in Mississippi, take land there and become citizens of the States. A great many Choctaw Indians did this who names Colonel Ward failed to register upon his list known as Ward’s register,. His neglect to do so caused a good any Indians who had land in the old Choctaw Nation upon which they had improvements to lose both; both the land and the improvements were taken from them and sold at its public land sales. This caused so many complaints among the Choctaw Indians that these two Commissions were appointed. Q. Do you know whether any of your Choctaw ancestors went before either of these two Commissions and claimed benefits as Choctaw Indians under that article of that treaty? A. No, sir; I don’t know. Q. Did any of your Choctaw ancestors receive any scrip from the government or certificates as we would call them now, which scrip entitled them to select land either in Mississippi, Alabama, Louisiana, or Arkansas? A. I don’t know. This scrip was issued under the act of Congress of August 23rd, 1842, and was issued to those Indians who proved their claims under article fourteen of the treaty of 1830 and also proved that they had land in the old Choctaw nation which the government had taken from them and sold at its public land sales. Q. Do you speak the Choctaw language? A. No, sir. Q. Have you any evidence you want to introduce now in support of this claim? A. None except my father. Q. You want to introduce your father as a witness in this case? A. Yes, sir. Q. Except his testimony, have you any evidence you want to present? A. No, sir. Q. Would you like until the first of July in which to present other testimony? A. Yes, sir. This applicant will have until July first, 1902, in which to present other testimony in support of this application. In his weekly Saturday Night Fun post, Randy at Geneamusings suggested we write about our ancestor who is #21 on our Ahnentafel charts. Ahnentafel is a numbering system for genealogical ascents. For those who like math, it is a very intuitive numbering system. For person X, the father is 2*X, and the mother is (2*X)+1. Those who like math will instantly note that something fun and exciting is happening here with each generation. The paternal ascent follows the powers of 2. So? It suggests that converting the numbers to binary might have some benefits. Every binary number is going to start with '1' - treat that as yourself (or whoever your source person is). Every 0 indicates a paternal branch and every '1' indicates a maternal branch. * Broken down in powers of 2, 21 is 16+4+1. * So the binary ahnentafel would be 10101. * That's my father's mother's father's mother. Her Hebrew name was Nechama meaning 'comfort.' She married Selig Dudelsack somewhere in Poland. They immigrated in 1890 and 1891, with Selig coming first, and Annie following several months later with children and mother-in-law. They changed their name to Feinstein in America. I have been unable to find a photograph of her so far, though I am hopeful some cousin will turn up with one. I have several Feinstein family photographs pre-dating the 1930s, so I'd be surprised if no one ever got her on film. When you enter your family tree at Ancestry.com (with a setting either as a Public or Private Family Tree) Ancestry will provide what they call 'hints' when they see a record anywhere in their databases they think matches one of the entries in your tree. When I first entered my family tree I wasn't really impressed with this, because I'm pretty good at searching the databases, so it wasn't turning up things I hadn't already discovered. However, there are two factors I didn't consider. 1) Most obviously, Ancestry is constantly adding databases, and *should* add the hints pretty quickly after new databases are added. So paying attention to any new hints should reveal sources in new databases. 2) Ancestry's algorithm for hints catches more than my normal searches would. Not that I can improve my searches much, either, because I am a human, and not a computer, and I don't have the time to go digging through random databases. For example, naturally, I have entered first and middle names of individuals in my family tree where I know them. However, if in the database they are listed by their initials and surname only, I'm not likely to catch them in my Ancestry-wide searches. If I am searching a particular database I know they have to be in, I'll get more creative. I'll even search by surname alone, but while I don't have 'Smith' as a family surname, many of them are common enough to make that method impractical across the entire site. But browsing for hints, I saw the little Ancestry hint leaf flashing for my mother, and I found that odd, because few databases exist where her records are available yet. She'll be in the 1940 census, but we have to wait until 2012 for that. However, states sometimes have censuses in off years, and I discovered that there is one state that has already released their 1935 and 1945 census - Florida. I knew my grandfather had been stationed in Florida at the end of the war, and his wife and children had come out to join him. It was for a brief period of time before they returned to St. Louis, but it happened to be the right time for the 1945 Florida census. 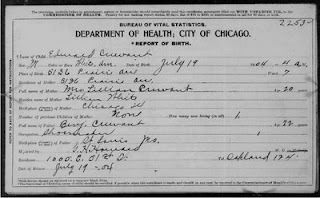 Below is the Birth Report for an "Edward Cruvant" son of Ben Cruvant and Lillian White. Ben was my great grandmother's brother. Approximately 1903 Ben and his father Morris traveled to Chicago, perhaps exploring the possibility of moving the family there. Ben and Lillian were married in May of 1904. Edward was born two months later. A sister, Sarah, was born in July of 1905. East St. Louis City Directories indicate they'd moved back to St. Louis by 1907. By 1910 Lillian and her two kids had returned to Chicago, and Ben remained in St. Louis, remarrying in 1912. The existence of a first wife and children wasn't hid from his second family, but no one knew what had happened to them. In the 1910 census Lillian's son was indexed as Clifford E.
What's really strange, is that on FamilySearch, he is indexed as "Clifford Paul." The name Clifford appears nowhere on the Report. Nowhere at all. The image clearly says, 'Edward.' Please feel free to look at the image below and verify this for me, but the name couldn't be clearer. If I didn't know about the 1910 census I would scratch my head and really question the eyesight of the poor indexer, or maybe think there was some database error where the given name from one certificate got indexed with the surname from another . Because of the 1910 census, I know the odds are good this wasn't a mistake. My assumption is that the indexer had another document in addition to the Birth Report. A document they haven't scanned in. I want to know what that document is, what other information I might expect to find on it, and where I can get a copy of it. Update: Cynthia at ChicagoGenealogy not only tells me what the document was (a Certificate of Correction) she finds it on the Family History Library microfilm and scans it in for me. Thanks! The FHL copy doesn't include the date of the correction, but the County Clerk at the time of the correction was the 'infamous' Michael J Flynn, who was County Clerk from 1934-1950, so the correction was at least 30 years afterwards. I thought I would go over the terms that scared everyone, and the old terms, and share my interpretation. Because my interpretation differs from many. I am not a lawyer, and my interpretation could be wrong. But I went over the language carefully. I agree the legalese can be lessened dramatically, but the terms released at the beginning of the month seem BETTER to me than the previous terms. I will explain why I feel this way, and why I look forward to the less legalistic version they produce in the hopefully near future. I will deal with the terms line by line. Yes, all of this is necessary. Post something on Facebook, and Facebook needs the right to display it to those you have marked as your 'Friend'. They need the right to transfer this right in case they sell Facebook to new owers. It needs to be worldwide so Friends of yours in Paris, Toyko, and Great Britain can all legally read it. It also needs to be perpetual, as Facebook explained, if you post something on a Friends 'wall' and then you delete your account, and your Friend's account is still there, it should remain on your Friend's wall. If they didn't have the world 'perpetual' there, you could sue them once you deleted your account and your words remained on your Friend's wall. In today's legalistic society, you would likely win. Facebook doesn't want that. This seems like a lot. But there isn't a consensus on how to use traditional copyright terms with respect to the internet. You can upload videos to Facebook, and when a friend plays that video, that is a 'public performance' and it's 'streaming' Photos you upload can be tagged with the names of friends who appear in that photo. Tagging the photo might be considered modifying, editing, adapting, or creating derivative works. So, yes, Facebook probably needs all those rights. I'll grant they can and should make it clear that they are only claiming those rights for use within the Facebook website, and they claim no rights to use the content off Facebook. It's hard to compare the terms to those on other sites which don't allow such a varied amount of actions. Sure, Twitter's terms are extremely simple, but all you can do is post text 140 characters in length. No images, no video, no tagging. There are some websites that allow you to upload images or video, but they don't have the same social networking capabilities. Apples need to be compared to apples. * The 'or promotion thereof' here appears to refer to the User Content, not something they're doing with your user content. Few of us are promoting Facebook with their user content, so only 'on or in connection with the Facebook Service' applies to us. * There is no public/everyone privacy settings. When you are logged into your account, you can click on the Settings link at the top of the screen and change your privacy settings. The default for most Facebook Applications is "Friends and Network." You probably don't want it set this way. It means anyone in your Network can view your material. Your Network is your College, or Region which you signed up under. My network is St. Louis, Missouri. I don't want all Facebook users in St. Louis to be able to view everything. (That's how potential employers, etc find stuff you don't want them to find.) Set it to "Friends Only". That way only your specified Friends will be able to see what you put on Facebook. * a "Share Link' is Facebook terminology for a widget they allow websites (such as newspapers or blogs) to put on content that allow readers to directly post that content to their Facebook pages. A link you put in a status update to a page on your website or blog is *not* a 'share link'. It doesn't "enable a user to Post" does it? It only enables them to follow the link and read it off-Facebook. To find out how to become what Facebook calls a "Share Partner" follow the link above. * OK. I don't like them being able to use my name, image or likeness for commercial or advertising purposes. But I believe all user content you upload is still restricted by your privacy settings. Some, such as Fox News, reported that the Terms gave Facebook permission to use the photo you uploaded of your kids for advertising...I don't see where it does. The image of your children doesn't fall under the category "your name, likeness, or image.' I think the only image they'd be legally able to use would be your profile picture, and I'm not even sure they'd be able to use that, because the restriction to your privacy settings should still apply. each of (a) and (b) on or in connection with the Facebook Service or the promotion thereof." * this "or the promotion thereof' applies I think to their actions, but still within your privacy settings. As I covered with the word 'perpetual' at the top of the Terms, it is necessary, unless all comments you post anywhere on the site are supposed to be deleted once your account is deleted. They could go that route, but the comparison that Facebook makes in their blog is apt. The email you send your friends doesn't disappear when you want it to. If you don't want your friends to have an email you send them forever, you shouldn't send it to them in the first place. The most important difference, from my perspective, is the *ADDITION* of the privacy settings language. It's not there in the old terms. It's not there in what is the current terms until they come back with the revision of the new terms. Yes, the heavy legalese isn't necessary. But I look forward to them releasing their New Terms in language everyone understands. They will be a marked improvement over what we had before, and have now. The 10th Edition of the Smile for the Camera has been posted at Shades of the Departed with participants displaying the varied costumes from their family photo albums. The word prompt for the 11th Edition of Smile For The Camera is brothers & sisters? Were they battling brothers, shy little sisters, or was it brother & sister against the world? Our ancestors often had only their siblings for company. Were they best friends or not? Show us that picture that you found with your family photographs or in your collection that shows your rendition of brothers & sisters. Below is the testimony of Eliza Caroline (Foster) Reeves, the daughter of Sarah Ann Hartley and her second husband, George Foster. She was the half-sister of Margaret Jane (Denyer) Van Every. Muskogee, I.T. November 26, 1900. In the matter of the application of Eliza C. Reeves for the identification of herself and her three minor children as Mississippi Choctaws. Q. What is your name? A. Eliza C. Reeves. Q. What is your age? A. Twenty-six. Q. What is your post office address? A. Lytton Springs, Caldwell County, Texas. Q. Are you a resident of the State of Texas? A. Yes, sir. Q. How long have you live in Texas? A. I was born and raised in Texas. Q. You never maintained a residence anywhere else? A. No, sir. Q. How much Choctaw blood do you claim? A. One eighth. Q. What is your father’s name? A. George Foster. Q. What is your mother’s name? A. Sarah Ann Foster. Q. Is she living? A. No, sir. Q. Through which one of your parents do you claim your Choctaw blood? A. My mother. Q. Was your mother’s name ever on any of the tribal rolls of the Choctaw Nation? A. No, sir. Q. Was your mother ever recognized as a citizen of the Choctaw Nation by the tribal authorities of the Choctaw Nation? A. No, sir. Q. Did you ever make application to the Choctaw tribal authorities for citizenship in the Choctaw Nation? A. No, sir. Q. Have you ever been recognized by the Choctaw tribal authorities by any official act of their National council as a citizen of the Choctaw Nation? A. No, sir; I never was. Q. Did you, or did any one in your behalf, in 1896, make application to this commission for citizenship in the Choctaw nation under the Act of Congress of June 10th, 1896? A. No, sir. Q. Have you ever been admitted to citizenship in the Choctaw Nation by a judgment of the United States Courts in the Indian Territory on appeal from the decision of the Choctaw tribal authorities or the decision of this Commission? A. No, sir. Q. Have you ever prior to this time made any application to either the Choctaw tribal authorities or to the authorities of the United States for either citizenship or enrollment as a Choctaw? A. No, sir. Q. This is your first application of any description? A. Yes, sir. Q. You are now making application for identification as a Mississippi Choctaw? A. Yes, sir. Q. Why do you believe you are entitled to be identified by this Commission as a Choctaw Indian entitled to rights in the Choctaw lands under the provisions of the 14th article of the treaty of 1830? A. Well, I was taught it on my mother’s side. Q. You were taught you were entitled to benefits under the 14th article of the treaty of 1830? A. Yes, sir. Q. You are making your claim solely under the provisions of the treaty of 1830? A. Yes, sir. Q. Did any of your ancestors ever comply with the provisions of the 14th article of the treaty of 1830? A. No, sir. Q. What was the name of your ancestor or ancestors who were recognized members of the Choctaw tribe of Indians in Mississippi in 1830 at the time the treaty was entered in to between the United States and the Choctaw Indians? A. George W. Hartley. Q. What relation was he to you? A. My grandfather. Q. You are a direct lineal descendant of his? A. Yes, sir. Q. Have you any evidence of the fact that he was a recognized member of the Choctaw tribe of Indians in Mississippi in 1830? A. No, sir. Q. What do you know about George W. Hartley’s residence in Mississippi and recognition as a Choctaw Indian? A. I don’t know anything. Q. Do you know when he left Mississippi? A. No, sir. Q. Do you know whether he died there? A. Yes, sir; I believe he did. I don’t know for certain. Q. When did your mother leave Mississippi? A. She left when she was a child. Q. How old would she be if she were living now? A. She was sixty-six when she died. She has been dead two years. Q. Did she come west with the Choctaw Indians when they removed from Mississippi? A. Her mother and her came to this country. Q. To what country? A. To Texas at the time, I think. Q. Did any of your ancestors signify to the United States Indian Agent of the Choctaw Indians in Mississippi their intention to remain and become citizens of the State of Mississippi within six months after the ratification of the treaty of 1830? A. No, I don’t know anything about that. Q. Did any of your ancestors ever receive or claim any land in Mississippi as beneficiaries under the 14th article of the treaty of 1830? A. No, not that I know of. I don’t know. Q. Do you make any claim by reason of any other treaty stipulations entered into between the United States and the Choctaw tribe of Indians? A. No, sir. Q. What is your husband’s name? A. William T. Reeves. Q. Are you making any claim for him? A. No, sir. Q. Is he a white man? A. Yes, sir. Q. He has never made a claim to Indian citizenship by blood? A. No, sir. Q. Where did you marry him? A. Buda, Texas. Q. When? A. November 17th, 1892. Q. Have you any children? A. Three. Q. Do you want to make application for your children? A. Yes. Q. What are the names and ages of your children? A. Nora Alice. Q. How old is she? A. Six years old. Q. The next one? A. Ada B. Reeves. Q. How old is Ada? A. She is five. She has turned five years now. Q. What is the next one? A. James Allen Reeves. Q. How old is James Allen? A. Three. Q. Is that all? A. Yes, sir. Q. Are you the mother of these children? A. Yes, sir. Q. Is William T. Reeves their father? A. Yes, sir. Q. Are you living with your husband? A. Yes, sir. Q. Are the children living with you? A. Yes, sir. Q. Is there any additional statement you desire to make in support of this application? A. No, sir. Q. Is there any written evidence you desire to offer in support of your application or the application you make on behalf of your three children? Mr. L.P. Hudson (Counsel for applicant.) The attorney for applicant here asks leave to file written evidence in support of this claim within fifteen days from this date. By the Commission: Permission is granted the attorney for the applicant to file written evidence in support of this application, provided the same is offered for filing with the Commission within fifteen days from this date. Examination --- by Mr. L.P. Hudson. Q. You say you live in Texas. Is it your intention to remove to the Indian Territory in the near future for the purpose of making your home here? A. Yes, sir. Q. You are a grand daughter of George W. Hartley, are you? A. Yes, sir. Q. And George W. Hartley was the father of your mother and also of Samuel D. Hartley? A. Yes, sir; they were brother and sister. Q. You are expecting to use the evidence in the case of Samuel D. Hartley in your care, are you? A. Yes, sir. Q. And you have relied upon Samuel D. Hartley looking up your matter for you? A. Yes, sir. Q. You know nothing of this matter except what you have been told? A. No, sir; that is all. By the Commission: The decision of the Commission as to your application and the application you make on behalf of your three minor children for identification as Mississippi Choctaws will be mailed to you in writing in the near future to your present post office address. The undersigned, Wm. S. Wellshear, being duly sworn, upon his oath states that he reported in full all proceedings had in this application for identification, and that the foregoing is a true and correct transcript of his stenographic notes thereof. Eliza says her mother was 66 when she died two years prior, this would suggest Sarah Hartley was born in 1832, and would have been born in Mississippi. Most census records indicate she was born about 1836, in which case she would likely have been born in Arkansas, as Samuel T Hartley's testimony indicated the Hartley family stopped in Little Rock. Eliza's reference to Texas as a different country is humorous, but possibly correct. Texas was annexed and became a state in 1845. It's not clear exactly when the Hartley family left Arkansas and entered Texas - sometime between 1835 and 1850. Research indicates Eliza had a brother George W Foster, Jr., and a sister Sarah Ann Foster. Neither appear to have testified in front of the Dawes Commission. I thought I would post more testimony from the Dawes Commission proceedings. This one delivered by my great grandfather, Melvin Elijah Van Every. In the matter of the application for identification as Mississippi Choctaws of Maggie J. Van Every and her five minor children. Q. Is it your desire to make application for the identification of your wife and minor children as Mississippi Choctaws? A. Yes sir. Q. How many children have you? A. Five. Q. What are the names and ages? A. Minnie R.
Q. What is the next one? A. Samuel. Q. The next one? A. Myrtle. Q. Where is your wife? A. In Maxwell Texas. Q. Why can’t she appear here in person? A. On account of infant being sick. Q. Have you a Doctor’s certificate as to her inability to appear before the Commission? A. No sir, but I can furnish it. Q. What does her disability consist of? A. Infant child being sick. Q. She is not sick herself? A. No sir, child is sick. Q. Nothing the matter with her? A. Infant child being sick. Q. Have you got power of attorney from your wife to appear for her? A. No sir. Q. Did she authorize you to make this appearance? A. Yes sir. Q. Any evidence of that fact? A. No sir. Not with me. Q. Are you fully conversant with your wife’s ancestors? A. Very well as I lived with them part of the time, up to the time of her mother’s death. Q. Are you competent to testify as to your wife’s residence in the state of Mississippi? A. No sir, not more than she is. I suppose I could testify as much as she could on account of her mother having lived with us up to her death. Q. You want to make application for the identification of your wife and minor children as Mississippi Choctaws? A. Yes sir. Q. Is the name of your wife or any of your minor children on any of the tribal rolls of the Choctaw Nation? A. No sir. By the Com. : Tribal rolls of the Choctaw Nation, prepared by the authorities of the Choctaw tribe, now in the possession of the Commission examined and the names of none of the applicants found thereon. Q. Have they ever been recognized by the tribal authorities of the Choctaw Nation as citizens of the Choctaw Nation? A. No sir. Q. Was an application ever made by your wife or by any one in her behalf or in behalf of her minor children to this commission in 196 for citizenship in the Choctaw Nation under the act of Congress of June 10, 1896? A. No sir. By the Commission: Record of applications for citizenship in the Choctaw Nation made to this commission in 1896 examined, and the names of none of the applicants found thereon. Q. Was your wife or children ever admitted to citizenship by judgment of the United States Courts in Indian Territory on appeal from the decision of the tribal authorities of the Choctaw Nation or of this Commission? A. No sir. By the Commission: Record of persons admitted to citizenship by the Choctaw Nation by judgment of the United States Courts in Indian Territory examined and the names of none of the applicants found therein. Q. Has any application ever been made prior to this time either to the Choctaw tribal authorities or the authorities of the United States for citizenship or enrollment of your wife and minor children? A. No sir. Q. This is the first application that has ever been made in their behalf? A. Yes sir. Q. What is her post office address? A. Maxwell, Texas. Q. Texas? A. Yes sir. Q. How much Choctaw blood does she claim? A. One eighth. Q. What was her father’s name? A. Ebenezer Denyer. Q. Is he living? A. No sir. Q. What is your wife’s mother’s name? A. Sarah Hartley Denyer. Q. Is she living? A. No sir. Q. Through which one of her parents does she claim her Choctaw blood? A. Through her grandfather. Q. Her parents? A. Her mother. Q. Was her mother’s name ever on any of the tribal rolls of the Choctaw Nation? A. No sir. Q. Was her mother ever recognized by a y of the tribal authorities of the Choctaw Nation as a citizen of that Nation? A. No sir. Q. Is the claim made by you for your wife and minor children as beneficiaries under the fourteenth article of the treaty of 1830? A. Yes sir. Q. Did your wife or any of her ancestors ever comply with the provisions of that article of that treaty? A. No sir. Q. What is the name of your wife’s ancestor who was a recognized citizen of the Choctaw Nation? A. George W. Hartley. Q. What relation was he to your wife? A. Grandfather. Q. Have you any evidence showing that George W. Hartley was a recognized member of the Choctaw tribe of the Indians in Mississippi? A. No sir, no evidence at the present time. Q. When did he leave Mississippi. A. I could not answer that question. Q. Do you know anything of his residence in Mississippi? A. No sir. Q. Do you know whether he signified to the United States Indian Agent his intention to remain and become a resident of the state of Mississippi after the ratification of the treaty of 1830? A. No sir. Q. Where? A. Buda, Hayes County, Texas. Q. Are these five children living with you? A. Yes sir. Q. Their residence is the same as yours? A. Yes sir. Q. You and your wife live together? A. Yes sir. Q. Is there any additional statement that you desire to make? A. No sir, only that I will furnish the certificate as to the ill health of the child and the power of attorney from my wife. Q. Is there any written evidence that you desire to file in support of this application for the identification of your wife and minor children as Mississippi Choctaws? Here attorney for the applicant asks leave to file additional testimony within fifteen days. Examination by Mr. Hudson, attorney for the applicant. Q. Mr. Van Every, is it your intention to remove to the Indian Territory in the near future for the purpose of establishing a residence and a home for yourself and family? A. Yes sir. Permission is granted the attorney for the applicant to file additional testimony in support of this application provided the same is offered to the Commission for filing within fifteen days from the date hereof. A copy of the decision of the Commission in regard to the application you make for the identification of your wife and minor children as Mississippi Choctaws will be mailed to you in near future to your present post office address. Anna Bell, having been first duly sworn by Acting Chairman Tams Bixby, on her oath states that as stenographer to the Commission to the Five Civilized Tribes she reported in full all testimony taken in the above entitled cause on November 20, 1900, and that the above and foregoing is a full, treue and correct transcript of her stenographic notes in said cause on said date. Emphasis has been added to the questions to increase readability. Editorial notes are my own addition. Even assuming that Melvin was rounding up to their next birthdays, he was still off by a year for the age of two of his children. I have a family record sheet, which I believe is a photocopy from the family Bible, listing all the birth dates of the children. It is strange that Evelyn and Myrtle were born on the same day 8 years apart, but the date appears on other documents for both of them. When my grandmother was 8 months old, she was sick with something. My great grandmother probably did know more about her mother's background than her husband, but not more than her uncle, so her presence wouldn't have made a difference. I was happy to hear Melvin testify that his mother-in-law Sarah Hartley Denyer was living with them at the time of her death. I knew that when she married her second husband, George Foster, they had lived (according to a note from my great Aunt Minnie) 'in a log cabin in South Texas'. From this testimony I am fairly sure she died in Caldwell County, Texas. Apple has been transcribing a huge collection of letters for over six months, and her efforts are inspirational. Though not nearly as large a collection as hers, I have many letters and other documents I've scanned in that I wish to transcribe, as well as a handful of audiotapes, and I thought setting up a day of the week where I would post transcriptions might encourage me to do so. Popular weekly blog memes include Wordless Wednesday, Tombstone Tuesday, and Friday Five. Alliteration seems to be a necessity, and as a poetry aficionado, it appeals to me as well. So, searching for an appropriate alliterative title, I decided to go with "Amanuensis Monday." It's a fairly obscure word, but fits my purpose. It also provides me with the weekend to prepare the posts. I am going to attempt to do this weekly, and others are welcome to participate. Feel free to leave a link to your transcription in the comments. Muskogee, I.T. Nov. 21, 1900. Q. What is your age? A. I am 70. Q. What is your post-office address? A. Turnerville, Texas. Q. Are you a resident of the state of Texas? A. Yes sir. Q. How long have you resided in Texas? A. I have been in Texas about sixty years I reckon. Q. Have you maintained a continuous residence in Texas for sixty years? A. Yes sir. Q. Where did you live prior to that time? A. Mississippi. Q. What part of Mississippi? A. Choctaw County. Q. Were your people recognized members of the Choctaw tribe of Indians in Mississippi in 1830? A. My grandmother. Q. Wasn’t your mother? A. Yes sir, my mother too. Q. What is your mother’s name? A. Eliza Beasley. Q. What is your father’s name? A. George W. Hartley. Q. That is your mother’s maiden name? A. Yes sir. Q. Is your father living? A. No sir, he’s dead. Q. Through which one of your parents do you claim your Choctaw blood? A. My father. Q. How much Choctaw blood do you claim? A. One fourth. Q. Was your father a recognized member of the Choctaw tribe of Indians in Mississippi in 1830? A. I don’t know, I reckon so. Q. When did you leave Mississippi? A. I left Mississippi in ’35 I believe. Q. Did your father come with you? A. Yes sir, come to Little Rock, Arkansas and died. Q. Your father left Mississippi in 1835 then? A. Yes sir. Q. Where did he start for? A. He started for Texas. Q. Do you know anything about his possession in the state of Mississippi? A. No, I do not. Q. Do you know whether he ever received any land in Mississippi as a beneficiary under the provisions of the 14th article of the treaty of 1830? A. I do not. Q. That is the article of the treaty under which you are making your claim is it not? A. Yes sir. Q. Did any of your ancestors ever comply with the provisions of that article of that treaty? A. Not as I know of anything about it. Q. Why did your father leave Mississippi? A. Because he wanted to come to Texas. Q. What did he want to come to Texas for? A. I do not know. Q. Did he signify to the United States Indian Agent for the Choctaw Indians in Mississippi that the wanted to stay there and become a citizen of the states? A. I don’t know that. Q. Did he remain there the five years as required by the provisions of that article of the treaty? A. I don’t know that. Q. Did any of your ancestors ever receive or claim any land in Mississippi as beneficiaries under the provisions of the 14th article of the treaty of 1830? A. No sir, I don’t think they did. Q. If your father was a recognized member of the Choctaw tribe of Indians in Mississippi in 1830 why did he not remove to the Indian territory with the other members of the tribe? A. I don’t know. Q. What do you know about your father’s Choctaw Indian citizenship in Mississippi? A. I know my father was a one fourth Choctaw. Q. Was any provisions ever made that you should receive any land in Mississippi under the provisions of the 14th article of the treaty of 1830? A. Not as I know of. Q. When were you born? A. In 1830. Q. What month? A. In March, the fourteenth. Q. You were living on the 27th of September, 1830 were you not? A. I guess I was. Q. You are aware of the fact that under the provisions of the 14th article of the Treaty of 1830 that you were entitled to certain considerations thereunder as a child? A. Yes sir. Q. Did you ever receive any benefits under that article of that treaty? A. Never did. Q. Are you making this claim under any other provisions of any other treaty between the United States and the Choctaw Indians? A. No sir. Q. Are you married? A. Yes sir. Q. What is your wife’s name? A. Nannie V. Hartley. Q. Is she a white woman? A. Yes sir. Q. Never made any claim to Indian citizenship by blood? A. No sir. Q. Are you making any claim for her now? A. No sir. Q. When did you marry her? A. In ’90. Q. Where were you married to her? A. In Texas. Q. Married in accordance with the laws of the state of Texas? A. Yes sir. Q. Have you your marriage license and certificate? A. Yes sir. Q. Have you them with you? A. No sir. Q. It will be necessary for the Commission to be supplied with evidence of your marriage to your wife in the matter of the identification of your children. Have you any children under 21 years of age and unmarried for whom you desire to make application? A. Three. Q. What are their names and ages? A. Ammie Hartley. Q. How old is she? A. Nineteen. Q. Who is the mother of Ammie Hartley? A. My first wife. Q. What was her name? A. Margaret Hartley. Q. Is she dead? A. Yes sir. Q. Have you your marriage license and certificate to Margaret Hartley? A. Yes sir. Q. It will be necessary for the Commission to be supplied with evidence of your marriage to your first wife in the matter of the application for the identification of this child. What are the names and ages of your other two children? A. Samuel H. Hartley. Sixteen. Q. This same mother? A. Yes sir. Q. The next one? A. By my second wife, Eddie R.
Q. How old is he? A. Ten years old. Q. This child is by your second wife? A. Yes sir. Q. These children all live with you at your home? A. Yes sir. Q. You and your wife living together? A. Yes sir. Q. Any additional statement you desire to make in support of this application? A. No sir. Q. Is there any written evidence that you desire to offer the commission for consideration in support of this application? Here attorney for applicant asks leave to file written evidence in support of this claim in 15 days from this date. Permission is granted the attorney for the applicant to file written evidence in support of this application provided the same is offered for filing with this Commission within fifteen days from the date thereof. By L.P. Hudson, attorney for the applicant. Q. Mr. Hartley is it your intention to remove to the Indian Territory for the purpose of making a home here? A. Yes sir. Q. And to do that in the near future? A. Yes sir. The decision of the Commission as to your application and the application you make on behalf of your three minor children for identification as Mississippi Choctaws will be mailed to you in writing sometime in the near future to your present post-office address. Myra Young, having been first duly sworn upon her oath states that as stenographer to the Commission to the Five Civilized tribes she reported in full all the proceedings had in the above entitled cause on the 21st day of November, 1900, and that the above and foregoing is a full, true and correct transcript of her stenographic notes of said proceedings on said date. Subscribed and sworn to before me this 22nd day of November, 1900. Questions emphasized above to improve readability. Samuel Tillman Hartley (burial info) was the brother of my second great grandmother, Sarah Ann (Hartley) Denyer. His first wife was Margaret Rawls, and his second wife was Nannie Virginia Rock (burial info). I first blogged about discovering these records on Footnote back in September. As you can see, while there wasn't enough evidence for the Commission to recognize the family as Choctaws, there was still a lot of good genealogical information to be discovered within the testimony. I am going to limit myself to items that are either public record, like the above, or were written by relatives who have been deceased at least fifty years. (Unless I receive permission otherwise from the author, if still alive, or their children.) In a post last September, Geneablogie explained the current death+70 restriction on unpublished works doesn't usually apply to pre-1976 works, though with works by family members I am going to proceed with caution. Best Picture - Best old family photo that appeared on your blog in 2008. Tell us which you liked best and why. Best Screen Play - Which family story that you shared in 2008 would make the best movie? Who would you cast as your family members? Best Documentary - Which was the best informational article you wrote about a place, thing, or event involving your family's history in 2008? Best Biography - Which was the best biographical article you wrote in 2008? Best Comedy - Which was the best funny story, poem, joke, photo, or video that you shared on your blog in 2008? The Van Every Apiary - a photograph of what may be my great grandfather, Melvin Van Every's bee colonies, and possibly my grandmother, Myrtle, standing on a hopefully empty box. To make a good movie a family story must have conflict, and a little bit of mystery doesn't hurt. The details of my Uncle Samuel Van Every's life - his possibly multiple wives, his problems with alcohol, the death of his son in a tragic accident, as told in his FBI file and various other documents could do just that. Who do I cast in the leading role? I'd probably want to go with someone who might bear a resemblance. Unfortunately, while I may have some photographs of my grandmother with her brother, none of them are labeled as such. Maybe I could choose one of my actor cousins with a Stoughton descent. Uncle Sam was born in Texas, and was a wanderer. The word 'ranger' comes to mind instantly. So how about Viggo Mortensen, Jr? He and I are likely 10th cousins, so Uncle Sam would have been 8th cousins with Viggo's grandfather. In these two posts I look at a study the Civic League of St. Louis conducted in 1908 on a neighborhood in which all of my paternal great grandparents lived at one time. A year-by-year chronology of the events in my maternal grandmother's life. A tie between two poems. and Ode to a Microspatula - a poem I wrote. This is a category I had to create for myself. Best usage of graphics, or other effects, in a post.